Cereal- A high protein/high caloric cereal with a low caloric cereal- Some favorite mixings include Kashi’s Go Lean Crunch cereals with their Honey Sunshine or Kashi’s Cinnamon Harvest with their Heart to Heart Honey Toasted Oats. I like Kashi because they offer more than just wheat in their cereals- they also include other whole grains. 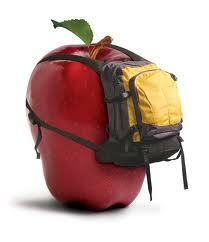 Thankful that there are others who realize how important it is to send their kids to school with an energized body! 🙂 Thanks for sharing!